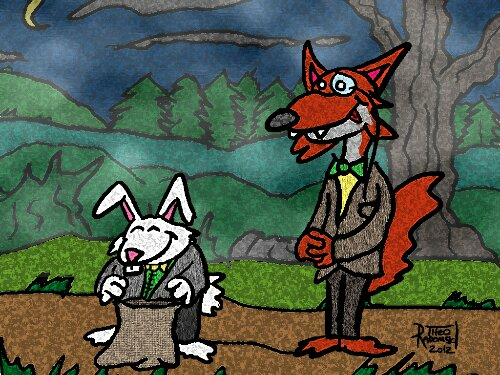 “Why Mr Fox!” said Mr Rabbit. Mr Fox regarded Mr Rabbit and slowly licked his lips. “I suppose there is no harm in trying” he said in languid honeyed tones. Mr Rabbit smiled and thumped his foot happily. “You won’t regret it, trust me” he babbled. As he turned to retrieve his bag, Mr Fox pounced forward, his powerful jaws clamped down and he whipped his head to the side, snapping Mr Rabbit’s neck and killing him instantly. Dark blood soaked through his white pelt.